Fiddle-Dee-Dee Designs: Blue Ribbon Beauties! Birthday Bash Storewide Sale, FWP and FreeBees! Blue Ribbon Beauties! Birthday Bash Storewide Sale, FWP and FreeBees! It's Scrap Orchard's 6th Birthday and we are having a Birthday Bash! We have a 35% Off Storewide Sale April 3-6, 2014 (yes, my new releases are 35% off! ), a free-with-purchase kit and add on for qualifying purchases, and on Friday night, we are having fun, games, and challenges. Please see my previous post to get all the details and view previews of the free-with-purchase kit and add on, as well as a look at my coordinating free templates you can download during our Birthday Bash 2014! Also, be sure to check out the Birthday Bash Forum at Scrap Orchard for the event agenda and get started on your Birthday Bingo card. It's the highest award ~ the blue ribbon prize at the county fair, the science fair, the art exhibit. 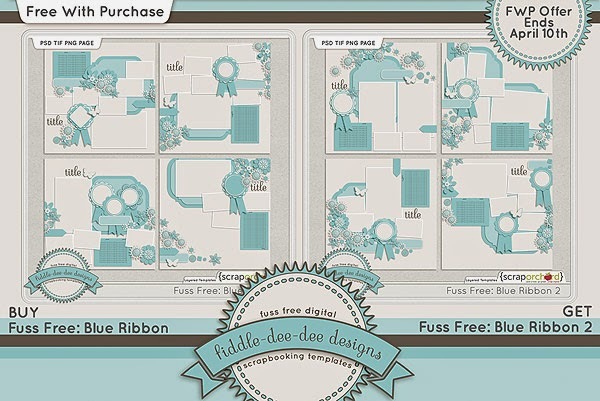 Fuss Free: Blue Ribbon and Fuss Free: Blue Ribbon 2 are sets of templates built around a layered prize ribbon and contains multiple photos, making it easy to document all those winning moments in life. This week you'll also find three template sets that are now being released in my store after being part of a designer feature or a site promotion. In the event that you missed a feature or promotion, these templates are packaged for your convenience. Fuss Free: Cool Treats was specifically designed for my Featured Designer spot at Scrap Orchard in August 2013. The templates feature popsicles and the bright, fun colors of summer. Fuss Free: Birds of a Feather was specifically designed for Scrapper Bowl 2014 at Scrap Orchard. The templates feature feather stamps that provide a light and airy feel to these multiple photo layouts. Fuss Free: Garden Party was specifically designed for my Featured Designer spot at Scrap Orchard in February 2014. The templates feature multiple photos, flower clusters and fun garden party lights. Purchase Fuss Free: Blue Ribbon and receive Fuss Free: Blue Ribbon 2 FREE! Offer valid through April 10, 2014. Here are some awesome layouts by my Creative Team and some of the HoneyBees! A new template from me will be coming on April 8th for Template Tuesday on the Scrap Orchard Blog. Be on the lookout for this template to add to your stash! Whew! There's always so much to share at the beginning of the month! I hope you enjoy all of these templates as you document all your precious memories! Thank you for all the gorgeous freebies!!!!!! !